Loom beading makes "fabric" out of beads. Tiny seed beads are woven over rows of thread. The beads are selected to make a pattern which emerges as row after row of beads are added. When the weaving process is finished, the beads at the ends must be secured to keep the piece from unraveling. The ends of the base threads must also be hidden to give the piece a finished appearance. 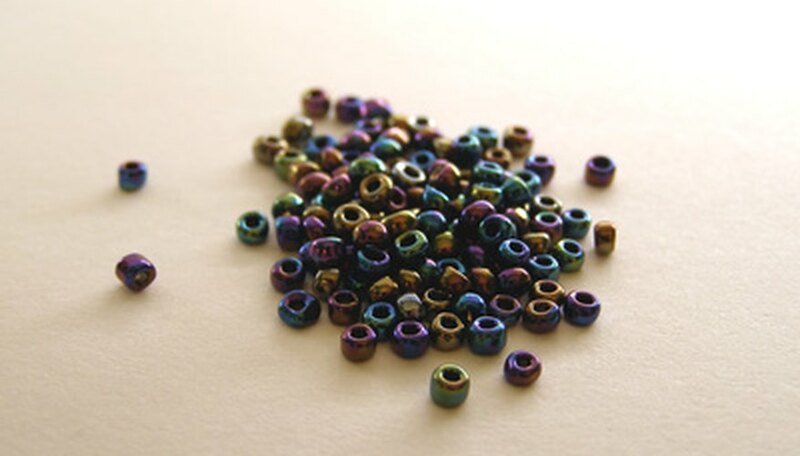 The beaded fabric can be made into bracelets or sewn onto clothing. Thread a needle onto the end of the thread you used to work beads onto your loom--if one was not already in place--at the end of your design. This thread is called the "woof" thread, while the threads that go across the loom are called the "warp." Weave the woof thread 1/2 inch back into the design. Cut the first two warp threads. at least 3 inches from the end of the bead work, and tie them together with an overhand knot close to the beads. An overhand knot is the type of knot you would tie at the end of a rope. Before you pull the knot tight, stick the point of a needle through the loop in the threads and into the hole in one of the beads. With the needle in place. pull the threads tight; the needle will position the knot right next to the bead. Tie off the remaining threads in the same way. Tie off the threads on both sides of the loom, only cutting two threads at a time. Dab a tiny drop of glue on each knot with a toothpick. Fold the warp threads under and sew on a leather backing or a strip of ribbon, keeping the ends of the strings tucked in as you sew all the way around the piece. If you are going to attach the beaded strips to clothing , you can hide the loose strings by folding them under and stitching around all the edges. Tuck the ends under and glue a hook-and-loop tape closure to each end of the piece to create a bracelet.